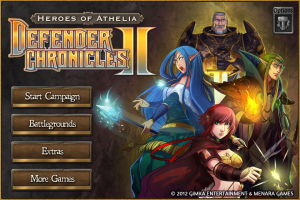 AZUSA, Calif. – May 24, 2012 – Gimka Entertainment, along with Menara Games, today announced the launch of Defender Chronicles II on the iTunes App Store, now available for $2.99. A follow-up to the best-selling iOS title Defender Chronicles – Legend of the Desert King, Defender Chronicles II combines the greatest and most beloved elements of tower defense and role-playing games. 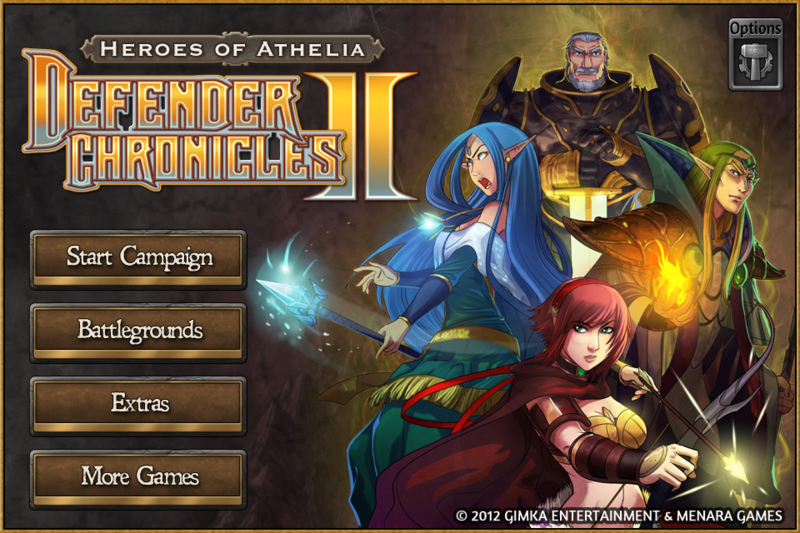 Fans of the series and newcomers alike can join the fight to save the war-torn world of Athelia today by downloading Defender Chronicles II from the App Store at http://itunes.apple.com/us/app/defender-chronicles-ii-heroes/id512772066?ls=1&mt=8. Defender Chronicles II pits players against merciless foes with innovative tower defense gameplay. Gamers will fight back advancing waves of Orc hordes, the supernatural Forsaken, and the shadowy Covenant cult by controlling and customizing four different heroes with unique abilities and acquired artifacts, in addition to using upgradeable base units. With five different game modes and difficulty levels, both tower defense novices and seasoned strategists will have plenty of challenges to conquer. Download the Press Kit (4mb) by clicking here. Based in sunny Azusa, CA, Gimka Entertainment is an award winning developer of Mobile, PC and Social Network games. They struck gold with their latest game, the massively addicting Defender Chronicles – Legend of the Desert King. Gimka Entertainment looks to make engaging and addicting games for serious fun seekers everywhere. Menara Games is an independent game developer based in Bandung, Indonesia, best known from developing downloadable hit titles such as Burger Rush, Restaurant Rush, Cate West series, hit flash game Demonrift TD, and the recently co-developed Defender Chronicles – Legend of the Desert King with Gimka Entertainment, Inc.